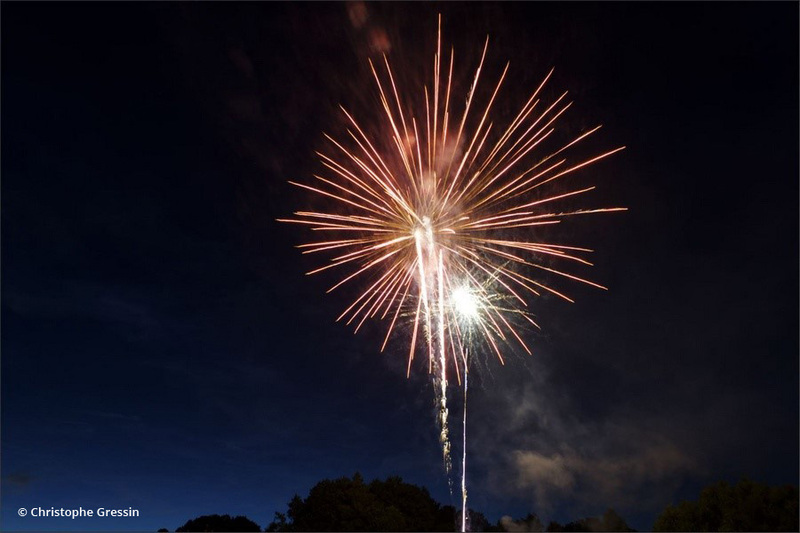 In this tutorial, after a few tips about shooting fireworks, we will show you how to correct some basic problems, and then manage the exposure and colors to obtain an optimal result. The difficulty in photographing fireworks is principally one of exposure, i.e., how to manage a very bright light source in an otherwise very dark environment. The short duration of the bursts makes it difficult to measure the exposure for each shot, which means you have to work in manual mode. Use a tripod as well as a remote-control shutter trigger. Contrary to the conventional rules about photographing moving subjects, it is possible and even recommended to work with rather long exposure times (up to several seconds). Because you will shoot at long exposure times, you should avoid shooting at a too-high ISO. Ideally, by shooting at your camera’s nominal sensitivity, you will be able to take advantage of your sensor’s maximum dynamic. Manually focus your shots: the autofocus will not be able to focus correctly or will take too much time. Generally speaking, a focus at infinity will work well. You can also make automatically focus on a distant subject, and then switch to MF mode to lock the focus. Choose a medium aperture (f/8 or f/11) to ensure that you will have sufficient depth of field. The adjustable variable with respect to the exposure will be the exposure time, understanding that the actual exposure time will be that of the firework burst itself. With a very long exposure time, you can superimpose many bursts without overexposing your image. To find the right exposure time, check the exposure for your first images and adjust the time if necessary. One last point: your location is also important. 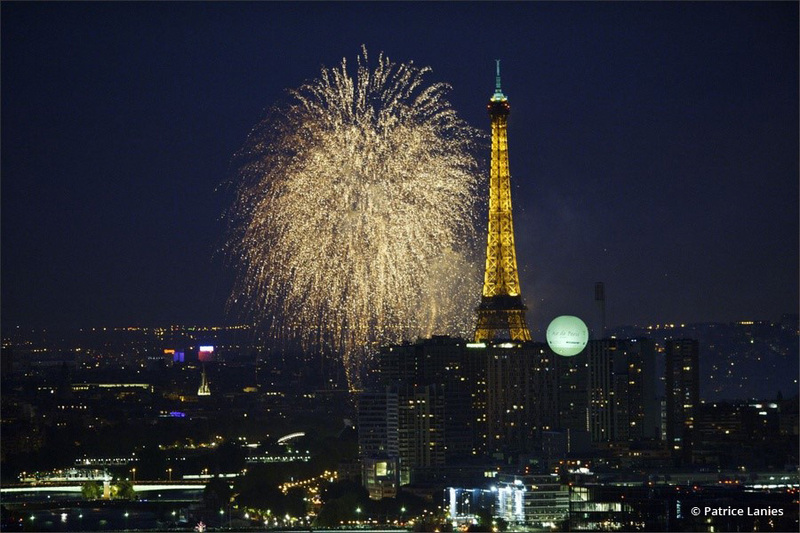 You can choose to include or exclude the elements in the environment and to select a focal distance that depends on how far you are from the firework bursts. A short focal length is recommended so as to provide good depth of field as well as to ensure that you will cut off the full burst! When you’re done shooting, work on your images in DxO Optics Pro 9 by following the advice in the rest of this tutorial. As soon as you open your image in DxO OpticsPro, the DxO Standard default preset corrections, adapted to your equipment, will be applied to it. In your reference image, find a gray or neutral area, or (by default) a pure white area; DxO OpticsPro will then correct the colors for the entirety of the image. It can often be difficult to find a reference white or gray reference spot in a fireworks photo, however, so you will most likely have to manually set the temperature using the dedicated slider. That’s the method that we will employ here, so set the slider to around 4000K. 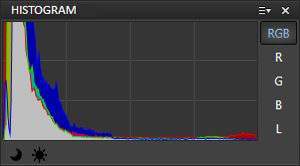 The Noise reduction – RAW palette lets you correct any noise in your image, if necessary. 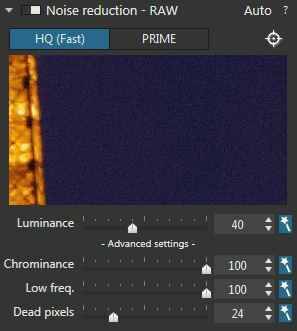 After you open your image, DxO OpticsPro will have automatically calculated the correction for noise by default; to see the result, zoom in to 100%. You can manually adjust this correction: boost the sliders to obtain a smoother rendering, or decrease the value to preserve a bit of noise so as not to flatten the details in the image. If you choose to smooth out your image, be careful not to lose too many details in the firework bursts. 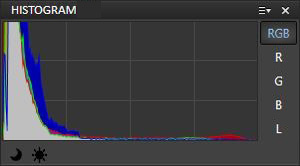 Here are some photos at 100% showing different correction settings. If you need to increase the correction level, we recommend that you use the PRIME denoising correction algorithm to preserve the details. It’s this last version that we will keep to work on further. The micro-contrast lets you amplify the fine details and thus reinforce the impression of sharpness; that is the case in our example in which this slider will help us bring out the details in the firework bursts. Set the micro-contrast on an intermediate value to achieve a satisfactory result; here we will choose 40. 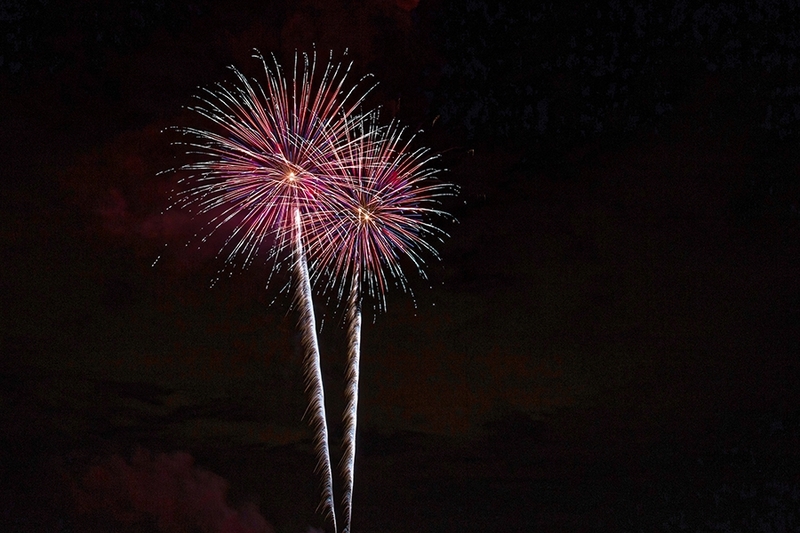 Fireworks photos are often strongly contrasted, what with the brightness of the bursts against the darkness of the night. Despite the constant advances in digital sensors, the dynamic range of the camera still may not be enough to capture the range present in the scene. 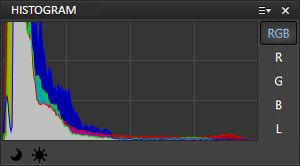 The histogram for this image is particularly stretched out, much more for the blacks than for the whites. 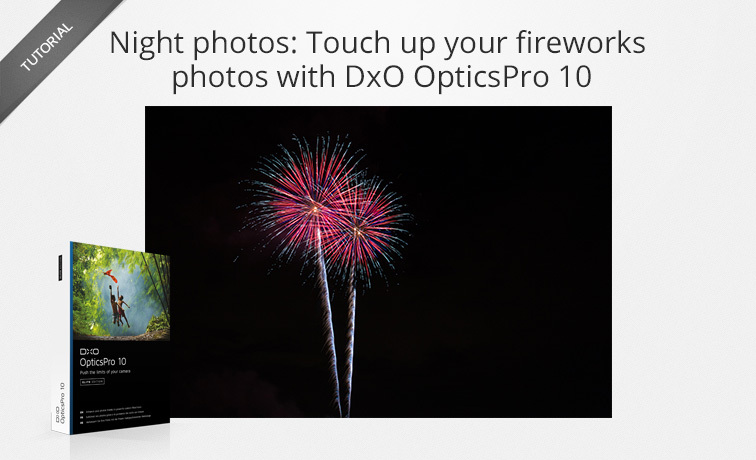 To recover the details in your image, we will use the following correction tools in DxO Optics Pro: Exposure Compensation and DxO Smart Lighting. The first will let you recover details in the highlights, and the second will rebalance the scene depending on the impact of the first correction applied. 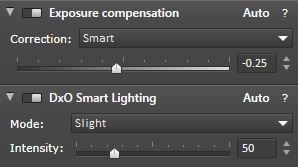 The Exposure Compensation tool analyzes the overall image and calculates an overall correction correlated with that of DxO Smart Lighting. You have the possibility of choosing the Highlight Priority mode with three correction levels, Slight, Medium, or Strong. For our example, let’s choose Strong. If there are still clipped areas among the highlights, they will be very diminished and the histogram will have moved toward the left. Consequently, the photo is darkened overall. We will compensate for this by using the DxO Smart Lighting feature, which optimizes the image’s dynamic range and uses its own image-analyzing algorithm to apply the correction at the intensity you choose. In this case, we will choose a Medium correction. Details reappear in the darkest zones, in particular the in the sky, and the left-hand side of the histogram has moved slightly toward the right. If necessary, you can finalize the exposure settings by using the Selective tone tool to adjust the luminosity for each tonal range, thereby achieving a perfect result. Color correction can take place in two steps: first, an overall correction using the Color accentuation palette, and then by adjusting each color channel using the HSL (Hue – Saturation – Luminance) tool. With the Color accentuation palette, you can correct the overall Vibrancy and the Saturation of the colors for the entirety of the image. When you want to strengthen or diminish the the dark blue of the sky, use the first slider, because it acts primarily on the less-saturated colors; the second slider acts equally upon all of the different color tones in the image. For an optimal result, set the Vibrancy before the Saturation, otherwise you risk obtaining an unpleasant rendering of the cool tones. In our example photo, in which the blue tones are already saturated, we will slightly decrease the Vibrancy (set to –20) and then increase the Saturation (set to +40). Use the HSL palette to finely adjust the colors, since it allows you to act on each color channel independently from one another. By working with the Blues channel, we will be able to brighten the sky while preserving a balanced colorimetry. 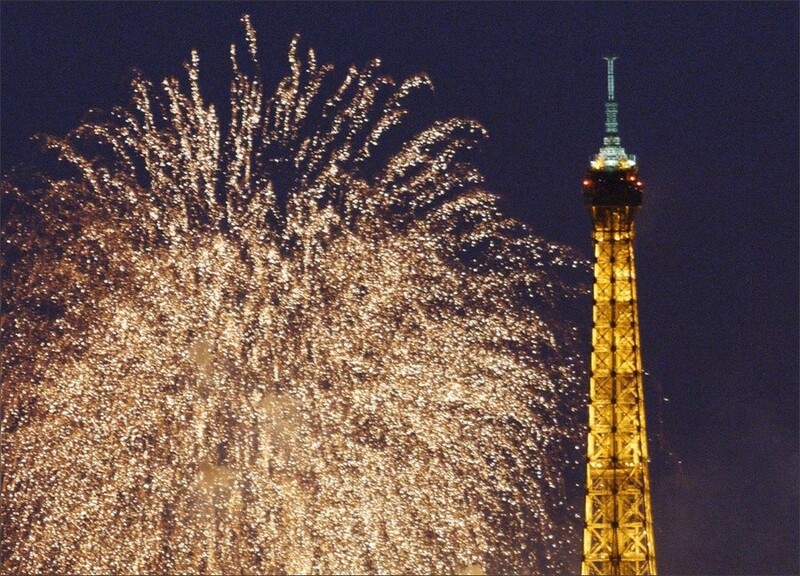 Next, choose the Reds channel to give more depth to the firework burst: set the Saturation to +20 and the Luminance to –15. Finally, we will bring out a little bit more of the litte yellow burst inside the big red one; to do so, set the Saturation to +25 and the Luminance to +25 in the Yellows channel. Finalize your image by adjusting the Micro-contrast to bring out the details; be careful not to push the slider too far, however, or you will make the smoke appear less ethereal. Set the slider to 30. In addition to the DxO Standard default preset, DxO OpticsPro provides you with creative presets on which you can base your processing work. Here are a few examples of the renderings available to you. DxO FilmPack offers an additional palette of creative tools that integrates completely with the DxO OpticsPro interface.